Heather Wurtele is about 45 sec behind Kaye in 4th, and she's no slacker on the run. 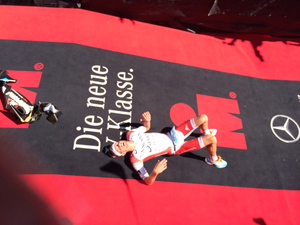 Sebastian Kienle has moved into 2nd 3:00 back, Boecherer 3:21 back. 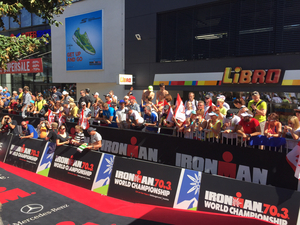 IRONMAN.comSeven weeks after the IRONMAN European Championship in Frankfurt, two German favorites go to battle once again. Gomez is running the fastest of the top men. 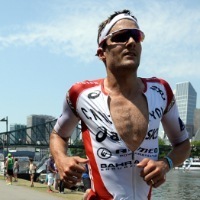 He is in 3rd now, just passed Boecherer. As Tim Don said before the race, "If you had half of Usain Bolt and half Mo Farah, you'd have Gomez." Women at 3k: Ryf, Beranek 5:00 back, Kaye at 8:45 back, Tisseyre at 8:45, and Wurtele 9:45. The athletes are probably thankful for the shade offered along the run course, which circles the beautiful lake they swam in this morning. Heather Wurtele was led off course on a stretcher after collapsing at the finish line.